Sun? Grass? Snow pants are optional? Spring may not exactly be here just yet, but it’s fast approaching. And of course Spring isn’t the only thing this month will gift us with. Enter: March Break! The Canadian family stereotype is to fly down to Florida and turn redder than the maple leaf on our flag (no, I’m not bitter), but for those of us that will be sticking around for the week we won’t be twiddling our thumbs. There are tons of options for families both out in the community and from home to keep your children engaged and happy to be out of school. 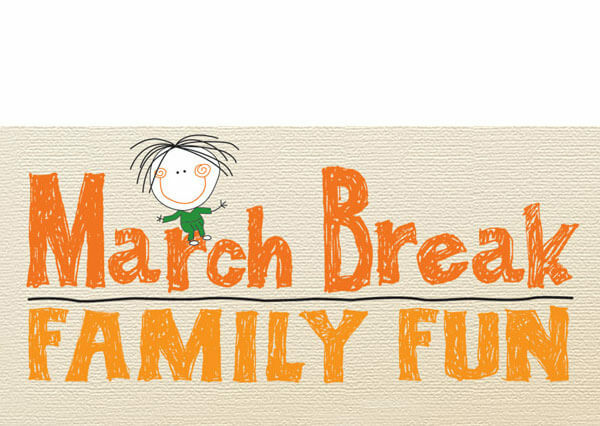 So here is a list of events and activities for the March Break! Try something new and take the family to a live music concert. To celebrate Canada’s 150th birthday, Stouffville is aiming to break the Guinness World record for the Longest Concert by Multiple Artists starting on March 17. The concert will span over 16 days of 24-hour non-stop music by over 400 artists. The support from the event goes to a number of charities including: Sick Kids Hospital, Gord Dowie’s Fund for Brain Cancer Research and many more. Be sure to bring earplugs or noise-cancelling headphones as the loudness can be harmful to any child let alone those with higher sensory sensitivity levels. Plus, with outdoor music festivals it’s very easy to make your own schedule and keep you space from the crowds while relaxing to some music. Many theatres in the area are hosting children and family focused matinee performances while school is out. The Second City Theatre is putting on a twist on an old children’s classic in a show called, Big Bad Wolf vs Lord Underwearface. The Solar Stage Children’s Centre has A Merry Munsch Pyjama Party based on the wonder works of Robert Munsch. Bubble Gubbies Live!, TWO different Disney on Ice performances, the list shows goes on. Be sure to plan ahead to best meet your child’s needs, whether that means adding your own intermission breaks or packing a favourite snack, etc. If you find the word “interactive” a key ingredient in a successful outing with your child, you may want to check out the Royal Ontario Museum’s newest exhibit, Out of the Depth: A Blue Whale Story featuring a colossal 80 foot whale on display and many aquatic themed hands-on activities. Or, if your tech head junior would like a shot at controlling a cybernetic arm, try Tiff Kids presents: digiPlaySpace where fun and the future collide in an interactive electronic playground. Of course, staying home and having something fun planned is a wonderful option for most days. Sometimes the simplest things can be the fondest memories, like reading a book together or spending a little time in the neighbourhood park or a Spring themed craft. Why not welcome in some feather friends with pinecone bird feeders? All you need is some big pinecones, coated with peanut butter (birds CAN eat peanut butter, I checked) and roll it in bird seed. The birds will love it and your kids can enjoy seeing the colourful creatures their creations brought into the yard. March Break may be about relaxing but that doesn’t mean your child can’t be put to work on extra housekeeping tasks. There’s no shame in getting the kids involved in the Spring cleaning whether that’s re-organizing toys and bedrooms, tidying up the house or, provided good weather, maybe a bit of yard work. And it’s never too early to tackle learning a new independent living skill together. They might not the highlight for them but it might as well be yours! Lastly, just because school stops, doesn’t mean the learning stops too! Ask your child’s teachers for suggestions about an Independent Activity Schedule to make for home. See what exactly your child is focusing on in class and have them work through a step-by-step schedule of self-directed tasks. This is a handy teaching tool to whip out at any time or place that can positively affect your child learning and development. We hope these ideas can help make your March Breaks fun and relaxing no matter where or what your family does. This break period is the perfect opportunity for the students to unwind a bit before having a fresh start to another season of learning and adventure as the Lighthouse team is excited to do the same!